Punica granatum, Moyogi stile, about 40 years old, from the Bonsai museum in Pescia, Italy. Bonsai (Japanese: 盆栽, lit. 'tray planting', pronunciation (help·info)) is the Japanese pronunciation of the Sino-Japanese word "盆栽". It is an Asian art form using cultivation techniques to produce small trees in containers that mimic the shape and scale of full size trees. Similar practices exist in East Asian cultures, including the Chinese tradition of penzai from which the Japanese version Bonsai originated, and the derivative miniature living landscapes of Vietnamese Hòn Non Bộ. The Japanese tradition dates back over a thousand years. The Japanese loanword "bonsai" has become an umbrella term in English, attached to many forms of potted or other plants, and also on occasion to other living and non-living things. According to Stephen Orr in The New York Times, "the term should be reserved for plants that are grown in shallow containers following the precise tenets of bonsai pruning and training, resulting in an artful miniature replica of a full-grown tree in nature." In the most restrictive sense, "bonsai" refers to miniaturized, container-grown trees adhering to Japanese tradition and principles. The purposes of bonsai are primarily contemplation for the viewer, and the pleasant exercise of effort and ingenuity for the grower. By contrast with other plant cultivation practices, bonsai is not intended for production of food or for medicine. 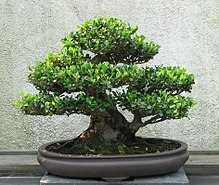 Instead, bonsai practice focuses on long-term cultivation and shaping of one or more small trees growing in a container. The practice of bonsai is sometimes confused with dwarfing, but dwarfing generally refers to research, discovery, or creation of plants that are permanent, genetic miniatures of existing species. Plant dwarfing often uses selective breeding or genetic engineering to create dwarf cultivars. Bonsai does not require genetically dwarfed trees, but rather depends on growing small trees from regular stock and seeds. Bonsai uses cultivation techniques like pruning, root reduction, potting, defoliation, and grafting to produce small trees that mimic the shape and style of mature, full-size trees. 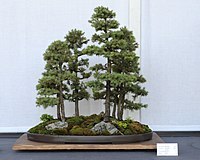 A close relationship between Japan's Zen Buddhism and the potted trees began to shape bonsai reputation and esthetics. In this period, Chinese Chan (pronounced "Zen" in Japanese) Buddhist monks taught at Japan's monasteries. One of the monks' activities was to introduce political leaders to various arts of miniature landscapes as admirable accomplishments for men of taste and learning. Potted landscape arrangements up to this period included miniature figurines after the Chinese fashion. Japanese artists eventually adopted a simpler style for bonsai, increasing focus on the tree by removing miniatures and other decorations, and using smaller, plainer pots. Around the 14th century, the term for dwarf potted trees was "the bowl's tree" (鉢の木, hachi no ki). This indicated use of a fairly deep pot, rather than the shallow pot denoted by the eventual term bonsai. Hachi no Ki (The Potted Trees) is also the title of a Noh play by Zeami Motokiyo (1363–1444), based on a story in c. 1383 about an impoverished samurai who burns his last three potted trees as firewood to warm a traveling monk. The monk is a disguised official who later rewards the samurai for his actions. In later centuries, woodblock prints by several artists depicted this popular drama. There was even a fabric design of the same name. Through these and other popular media, bonsai became known to a broad Japanese population. Depicting foliage in the Manual of the Mustard Seed Garden. This work had a large influence on bonsai during the Edo period. In Japan after 1800, bonsai began to move from being the esoteric practice of a few specialists to becoming a widely popular art form and hobby. In Itami, Hyōgo (near Osaka), Japanese scholars of Chinese arts gathered in the early 19th century to discuss recent styles in the art of miniature trees. Many terms and concepts adopted by this group were derived from the Jieziyuan Huazhuan (Manual of the Mustard Seed Garden in English; Kai-shi-en Gaden in Japanese). The Japanese version of potted trees, which had been previously called hachiue or other terms, were renamed bonsai (the Japanese pronunciation of the Chinese term penzai). This word connoted a shallow container, not a deeper bowl style. 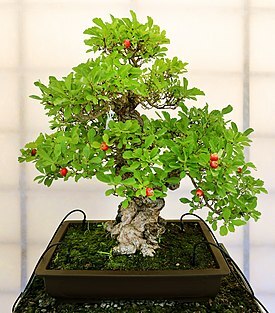 The term "bonsai", however, would not become broadly used in describing Japan's dwarf potted trees for nearly a century. The popularity of bonsai began to grow outside the limited scope of scholars and the nobility. On October 13, 1868, the Meiji Emperor moved to his new capital in Tokyo. Bonsai were displayed both inside and outside Meiji Palace, and those placed in the grand setting of the Imperial Palace had to be "Giant Bonsai", large enough to fill the grand space. The Meiji Emperor encouraged interest in bonsai, which broadened its importance and appeal to his government's professional staff. New books, magazines, and public exhibitions made bonsai more accessible to the Japanese populace. An Artistic Bonsai Concours was held in Tokyo in 1892, followed by publication of a three-volume commemorative picture book. This event demonstrated a new tendency to see bonsai as an independent art form. In 1903, the Tokyo association Jurakukai held showings of bonsai and ikebana at two Japanese-style restaurants. Three years later, Bonsai Gaho (1906 – c. 1913), became the first monthly magazine on the subject. It was followed by Toyo Engei and Hana in 1907. The initial issue of Bonsai magazine was published in 1921 by Norio Kobayashi (1889–1972), and this influential periodical would run for 518 consecutive issues. Ulmus parvifolia bonsai, informa upright style, about 120 years old. Some pots are highly collectible, like ancient Chinese or Japanese pots made in regions with experienced pot makers such as Tokoname, Japan, or Yixing, China. Today many potters worldwide produce pots for bonsai. Formal upright or chokkan (直幹) is a style of trees characterized by a straight, upright, tapering trunk. Branches progress regularly from the thickest and broadest at the bottom to the finest and shortest at the top. Informal upright or moyogi (模様木) is a style of trees incorporating visible curves in trunk and branches, but the apex of the informal upright is located directly above the trunk's entry into the soil line. Slant or shakan (斜幹) is a style of bonsai possessing straight trunks like those of bonsai grown in the formal upright style. However, the slant style trunk emerges from the soil at an angle, and the apex of the bonsai will be located to the left or right of the root base. Cascade or kengai (懸崖) is a style of specimens modeled after trees that grow over water or down the sides of mountains. The apex (tip of the tree) in the semi-cascade or han kengai (半懸崖) style bonsai extend just at or beneath the lip of the bonsai pot; the apex of a full cascade-style falls below the base of the pot. Shari or sharimiki (舎利幹) is a style involving the portrayal of a tree in its struggle to live while a significant part of its trunk is bare of bark. Growing-in-a-rock, also known as ishizuke or ishitsuki (石付), is a style in which the roots of the tree are growing in soil contained within the cracks and holes of the rock. Forest (or group) or yose ue (寄せ植え) is a style comprising the planting of several or many trees of one species, typically an odd number, in a bonsai pot. Raft or ikadabuki (筏吹き) is a style of bonsai that mimic a natural phenomenon that occurs when a tree topples onto its side from erosion or another natural force. Branches along the top side of the trunk continue to grow as a group of new trunks. Literati or bunjin-gi (文人木) is a style characterized by a generally bare trunk line, with branches reduced to a minimum, and foliage placed toward the top of a long, often contorted trunk. Broom or hokidachi (箒立ち) is a style employed for trees with fine branching, like elms. The trunk is straight and branches out in all directions about ​1⁄3 of the way up the entire height of the tree. The branches and leaves form a ball-shaped crown. Windswept or fukinagashi (吹き流し) is a style describing a tree that appears to be affected by strong winds blowing continuously from one direction, as might shape a tree atop a mountain ridge or on an exposed shoreline. ^ Gustafson, Herbert L. (1995). Miniature Bonsai. Sterling Publishing Company, Inc. p. 9. ISBN 0-8069-0982-X. ^ "Day of the bonsai vegetables". The Independent. Retrieved 2018-08-06. ^ "Not All Trees Are Cut Out to Be Bonsai". The New York Times. Retrieved 2018-08-06. ^ a b Chan, Peter (1987). Bonsai Masterclass. Sterling Publishing Co., Inc. ISBN 0-8069-6763-3. ^ Owen, Gordon (1990). The Bonsai Identifier. Quintet Publishing Ltd. p. 11. ISBN 0-88665-833-0. ^ a b Taylor, Patrick (2008). The Oxford companion to the garden (2nd ed.). Oxford: Oxford University Press. p. 53. ISBN 978-0-19-955197-2. ^ Hu, Yunhua (1987). Chinese penjing: Miniature trees and landscapes. Portland: Timber Press. p. 128. ISBN 978-0-88192-083-3. ^ Keswick, Maggie; Oberlander, Judy; Wai, Joe (1991). In a Chinese Garden: The Art and Architecture of the Dr. Sun Yat-Sen Classical Chinese Garden. Vancouver: Raincoast Book Dist Ltd. p. 59. ISBN 978-0-9694573-0-5. ^ Yoshimura, Yuji (1991). "Modern Bonsai, Development Of The Art Of Bonsai From An Historical Perspective, Part 2". International Bonsai (4): 37. ^ Kobayashi, Konio (2011). Bonsai. Tokyo: PIE International Inc. p. 15. ISBN 978-4-7562-4094-1. ^ "Japanese Paintings: to 1600". Magical Miniature Landscapes. Retrieved 2010-04-07. ^ Covello, Vincent T. & Yuji Yoshimura (1984). The Japanese Art of Stone Appreciation, Suiseki and Its Use with Bonsai. Charles E. Tuttle. p. 20. ^ Nippon Bonsai Association. Classic Bonsai of Japan. p. 144. ^ Redding, Myron. "Art of the Mud Man". Art of Bonsai. Retrieved 2010-04-07. ^ "Hachi-No-Ki". Magical Miniature Landscapes. Retrieved 2016-08-10. ^ a b c Naka, John Yoshio (1982). Bonsai Techniques II. Bonsai Institute of California. p. 258. ^ "Oldest Bonsai trees". Bonsai Empire. Retrieved 2013-11-11. ^ Nippon Bonsai Association. Classic Bonsai of Japan. pp. 151–152. ^ Warren, Peter (2014). Bonsai. Dorling Kindersley. pp. 10–11. ISBN 978-1-4093-4408-7. The elite class of monks, scholars, and artists took a slightly different path during the Edo period, [...] One of the biggest influences for the literati artists was the Mustard Seed Garden Manual (Jieziyuan Huazhuan), first published in 1679, which showed how to paint the idealized images. The same images were then recreated in tree form by literati, who were also bonsai enthusiasts. ^ Koreshoff. Bonsai: Its Art, Science, History and Philosophy. pp. 7–8. ^ Naka, John (1989). "Bunjin-Gi or Bunjin Bonsai". Bonsai in California. 23: 48. ^ "Hachi-No-Ki". Magical Miniature Landscapes. Retrieved 2018-07-01. ^ Yamada, Tomio (2005). "Fundamentals of Wiring Bonsai". International Bonsai (4): 10–11. ^ Hill, Warren (2000). "Reflections on Japan". NBF Bulletin. XI: 5. ^ Yamanaka, Kazuki. "The Shimpaku Juniper: Its Secret History, Chapter II. First Shimpaku: Ishizuchi Shimpaku". World Bonsai Friendship Federation. Archived from the original on February 22, 2008. Retrieved 2011-09-29. ^ Nozaki. Dwarf Trees ( Bonsai ). p. 24. ^ Itoh, Yoshimi (1969). "Bonsai Origins". ABS Bonsai Journal. 3 (1): 3. ^ Nippon Bonsai Association. Classic Bonsai of Japan. p. 153. ^ "Bonsai and Other Magical Miniature Landscape Specialty Magazines, Part 1". Magical Miniature Landscapes. Retrieved 2016-09-13. ^ Kobayashi, Konio (2011). Bonsai. Tokyo: PIE International Inc. p. 16. ISBN 978-4-7562-4094-1. ^ "The Books on Bonsai and Related Arts, 1900 - 1949". Magical Miniature Landscapes. Retrieved 2016-09-13. ^ Yamada, Tomio (2005). "Fundamentals of Wiring Bonsai". 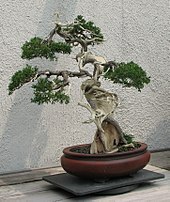 International Bonsai (4): 10. ^ "Kyuzo Murata, the Father of Modern Bonsai in Japan, Part 1". Magical Miniature Landscapes. Retrieved 2016-09-16. ^ Terry, Thomas Philip, F.R.G.S. Terry's Japanese Empire. Houghton Mifflin Company. p. 168. Retrieved 2010-04-07. ^ Pessy, Christian & Rémy Samson (1992). Bonsai Basics, A Step-by-Step Guide to Growing, Training & General Care. Sterling Publishing Co., Inc. p. 17. ^ Koreshoff. Bonsai: Its Art, Science, History and Philosophy. p. 10. ^ a b "Kokufu Bonsai Ten Shows, Part 1". Magical Miniature Landscapes. Retrieved 2016-09-16. ^ Nozaki. Dwarf Trees ( Bonsai ). pp. 6, 96. ^ a b "Bonsai Book of Days for April". Magical Miniature Landscapes. Retrieved 2016-09-13. ^ "The Conventions, Symposia, Demos, Workshops, and Exhibitions, Part 6". Magical Miniature Landscapes. Retrieved 2016-09-13. ^ "Yuji Yoshimura, the Father of Popular Bonsai in the Non-Oriental World". Magical Miniature Landscapes. Retrieved 2016-09-13. ^ "Saburō Katō, International Bridge-builder, His Heritage and Legacy, Part 1". Magical Miniature Landscapes. Retrieved 2016-09-13. ^ a b "About Bonsai Pots and Potters". Magical Miniature Landscapes. Retrieved 2016-09-13. ^ "The Imperial Bonsai Collection, Part 1". Magical Miniature Landscapes. Retrieved 2016-09-13. ^ "The Nations -- When Did Bonsai Come to the Various Countries and Territories?". Magical Miniature Landscapes. Retrieved 2016-09-13. ^ "Club Newsletter On-Line". Magical Miniature Landscapes. Retrieved 2016-09-13. ^ "How Many Bonsai Enthusiasts Are There?". Magical Miniature Landscapes. Retrieved 2016-09-13. ^ "It's All In The Soil by Mike Smith, published in ''Norfolk Bonsai'' (Spring 2007) by Norfolk Bonsai Association". Norfolkbonsai.co.uk. Archived from the original on 2007-09-30. ^ "Indoor Bonsai Tree". Bonsaidojo.net. December 25, 2013. Archived from the original on December 29, 2015. ^ Chan. Bonsai Masterclass. pp. 12–14. ^ Chan. Bonsai Masterclass. p. 14. ^ Adams, Peter D. (1981). The Art of Bonsai. Ward Lock Ltd. p. 134. ISBN 978-0-8317-0947-1. ^ Norman, Ken (2005). Growing Bonsai: A Practical Encyclopedia. Lorenz Books. pp. 176–177. ISBN 978-0-7548-1572-3. ^ Adams, Peter D. The Art of Bonsai. Color plates facing pp. 89, 134. ^ Andy Rutledge, "Bonsai Display 101", The Art of Bonsai Project. Accessed 18 July 2009. ^ Lewis, Colin (2001). The Art of Bonsai Design. Sterling Publishing Company, Inc.: New York. pp. 44–51. ISBN 0-8069-7137-1. ^ Adams, Peter D. The Art of Bonsai. Color plates following p. 88; p. 134. ^ "Japanese Styles of Bonsai". Magical Miniature Landscapes. Retrieved 2016-09-13. ^ D'Cruz, Mark. "Ma-Ke Bonsai Care Guide - Bonsai Styles". Ma-Ke Bonsai. Retrieved 2012-12-24. ^ Koreshoff. Bonsai: Its Art, Science, History and Philosophy. p. 153. ^ Zane, Thomas L. (2003). "Formal Upright Style Bonsai," Intermediate Bonsai; retrieved 2012-12-20. ^ Zane, "Informal Upright Style Bonsai"; retrieved 2012-12-20. ^ Zane, "Stanting Style Bonsai"; retrieved 2012-12-20. ^ Zane, "Semi-Cascade Style Bonsai"; "Cascade Style Bonsai"; retrieved 2012-12-20. ^ Naka, John Yoshio (1973). Bonsai Techniques I. Bonsai Institute of California. pp. 123–124. ISBN 0-930422-31-7. ^ "Sharimiki Bonsai". Bonsaiempire.com. Retrieved 2009-11-21. ^ Masakuni Kawasumi II; Masakuni Kawasumi III (2005). The Secret Techniques of Bonsai: A guide to starting, raising, and shaping bonsai. Kodansha International. pp. 86–91. ISBN 978-4-7700-2943-0. ^ Yuji Yoshimura & Barbara M. Halford (1957). The Art of Bonsai: Creation, Care and Enjoyment. Tuttle Publishing, North Clarendon VT USA. pp. 65–66. ISBN 0-8048-2091-0. ^ Zane, "Forest Style Bonsai"; retrieved 2012-12-20. ^ Zane, "Broom Style Bonsai"; retrieved 2012-12-20. ^ Koreshoff. Bonsai: Its Art, Science, History and Philosophy. pp. 178–185. ^ Gustafson. Miniature Bonsai. p. 17. ^ Gustafson. Miniature Bonsai. p. 18. ^ Lesniewicz, Paul (1996). Bonsai in Your Home. Sterling Publishing Company. ISBN 0-8069-0781-9.